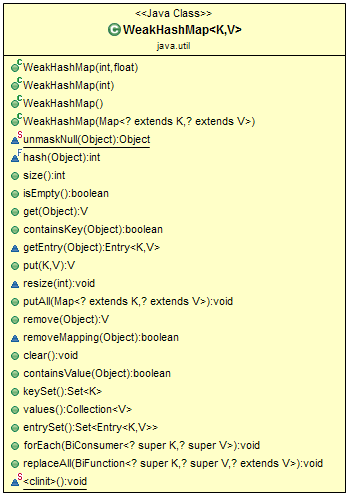 In this article, we will learn WeakHashMap class from java.util package with examples. WeakHashMap is a Hash table based implementation of the Map interface, with weak keys. An entry in a WeakHashMap will automatically be removed when its key is no longer in ordinary use. Both null values and the null key are supported. This class has performance characteristics similar to those of the HashMap class and has the same efficiency parameters of initial capacity and load factor. Weak Reference − If the only references to an object are weak references, the garbage collector can reclaim the object's memory at any time.it doesn't have to wait until the system runs out of memory. Usually, it will be freed the next time the garbage collector runs. WeakHashMap() - Constructs a new, empty WeakHashMap with the default initial capacity (16) and load factor (0.75). WeakHashMap(int initialCapacity) - Constructs a new, empty WeakHashMap with the given initial capacity and the default load factor (0.75). WeakHashMap(int initialCapacity, float loadFactor) - Constructs a new, empty WeakHashMap with the given initial capacity and the given load factor. WeakHashMap(Map<? extends K,? extends V> m) - Constructs a new WeakHashMap with the same mappings as the specified map. void clear() - Removes all of the mappings from this map. boolean containsKey(Object key) - Returns true if this map contains a mapping for the specified key. boolean containsValue(Object value) - Returns true if this map maps one or more keys to the specified value. void forEach(BiConsumer<? super K,? super V> action) - Performs the given action for each entry in this map until all entries have been processed or the action throws an exception. V get(Object key) - Returns the value to which the specified key is mapped, or null if this map contains no mapping for the key. boolean isEmpty() - Returns true if this map contains no key-value mappings. V put(K key, V value) - Associates the specified value with the specified key in this map. void putAll(Map<? extends K,? extends V> m) - Copies all of the mappings from the specified map to this map. V remove(Object key) - Removes the mapping for a key from this weak hash map if it is present. void replaceAll(BiFunction<? super K,? super V,? extends V> function) - Replaces each entry's value with the result of invoking the given function on that entry until all entries have been processed or the function throws an exception. int size() - Returns the number of key-value mappings in this map. Note that the key1 is null and its entry is removed and garbage collected.